The fact that George Steiner, more than anyone else, is at home in European culture – which spans centuries, and is essentially cosmopolitan – was reason enough to invite him for the Nexus Lecture. But there is another reason. As a true Lecturer in the Humanities, Steiner has the gift ‘to invite others into meaning’. 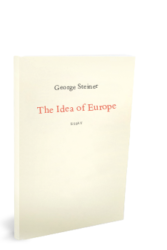 George Steiner is an essayist, writer, critic and cultural philosopher. After fleeing the increasing anti-Semitic violence in Europe, he spent a large part of his youth in the United States. There, he studied linguistics and humanities, finishing his studies at Harvard and Oxford. 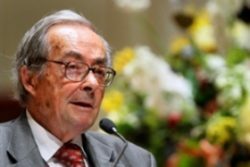 He was professor in the United States, England, Austria and Switzerland and an essayist and critic with publications such as The Guardian and The New Yorker. In his essays, he deals with literature, ethics, social developments and radical evil. Among his large oeuvre, In Bluebeard’s Castle, Language and Silence (1967), After Babel (1975) and Real Presences (1986) stand out. 2011 saw the appearance of The Poetry of Thought. The Nexus Institute published The Idea of Europe (2004) and Universitas? (2013). Im Raum der Stille: Lektüren (2010) is discussed in the Nexus Review.